French President Emmanuel Macron is a man on a mission in the US, trying to persuade Donald Trump not to tear up the Iran nuclear deal. It's a deal Trump says is the worst ever negotiated. His ultimatum: fix the flaws or I'll restore American sanctions next month. But, in Brussels, it seems there's no appetite for a new deal. 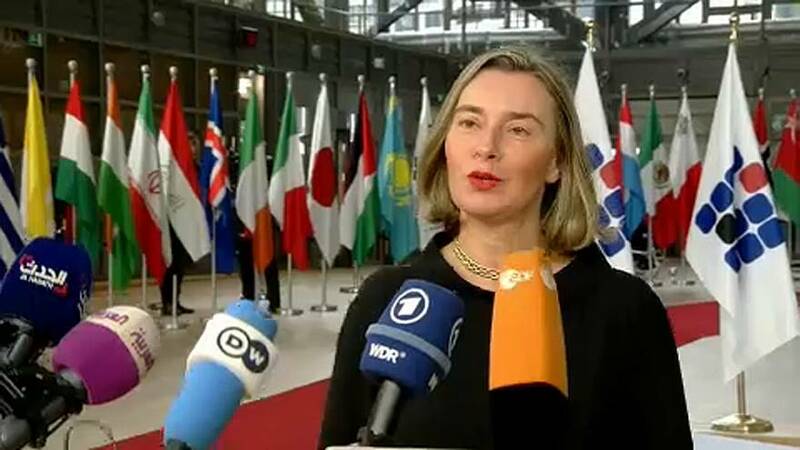 "The deal we have in place now, today, the only existing deal for the moment, is working, has been preventing Iran from developing a nuclear weapon and commits Iran to not develop a nuclear weapon without limits," said EU foreign policy chief Federica Mogherini. Macron, whose time with Trump comes ahead of Angela Merkel's US visit on Friday, has also talked about finding a political solution to rein Iran in Syria, Iraq and other countries. Majid Golpour, from the ULB university in Brussels, told Euronews: "The role of Europe depends on what President Macron and Merkel will put on the table with President Trump. "I think the most important part of this negotiation should be to separate Iran's intervention in Iraq and Syria from the deal, explaining to Trump that there are two different paths to preserve the deal." Under the 2015 nuclear deal, Iran agreed to curb its nuclear programme in return for the lifting of sanctions. The deal is seen as the best hope of stopping Tehran getting its hands on a bomb.